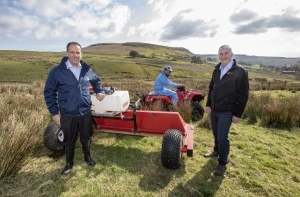 NI Water’s weed-wiping initiative, in conjunction with the Water Catchment Partnership, is being introduced in the Ballymoney area between April and October 2019 & 2020. The free weed wiping project is aimed at land managers tackling rush weeds in the catchment area of Eden Burn near Ballymoney. Other partners include UFU, NIEA, DAERA, CAFRE and the Voluntary Initiative. The launch of the Eden Burn weed-wiping trial took place earlier this week on the 28 March in Ballymoney Town Hall at 7.45pm. This was an open meeting for everyone in the area to attend. For anyone who missed the official launch of the project at Ballymoney Town Hall on Thursday 28 March, they can get further information by emailing weedwiping@niwater.com or by contacting our Farm Liaison Officer on 07803799217. 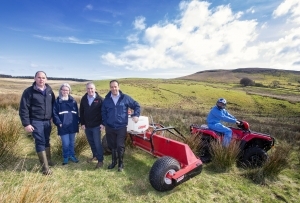 Photo Caption 1: Graeme Campbell (CAFRE), Rebecca Allen (NIW), Victor Chestnutt (UFU), Roy Taylor (NIW) and Dominic McCann (NIW).